Diffraction grating is a profiled surface of Si wafer in the form of a square consisting of a set of parallel Si strips, separated by an air space. Overall size of the square is 400 x 400 um2. The depth of the grating is 2.5 um at period 1 um. Accordingly, the aspect ratio of the diffraction grating is ~ 5. 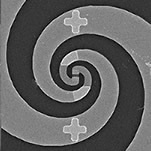 To create grating, first, a topological profile in resist was made using electron beam lithography. Then thin metal film of Cr was deposited on the surface. This film with the help of explosive lithography "lift-off" formed metal mask for subsequent etching. 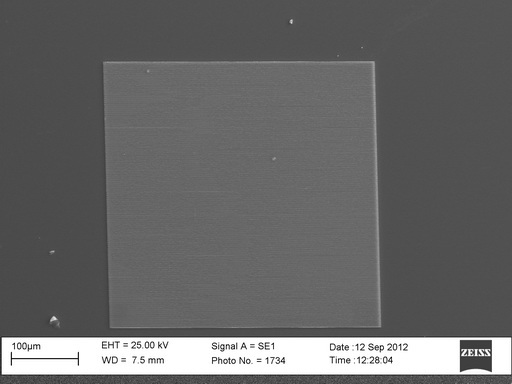 At final step, formation of the grid structure in the Si was carried out by reactive ion etching (ECR plasma). Top view of the Si X-ray diffraction grating with period of 1 um.